John Arthur Cox was born in Beeston in 18872, the only child of John (b. c1844, Lenton, Notts) and Elizabeth Ann, his wife (b. c1851, Ketton, Rutland, née Cunnington). John senior died in 18963, leaving Elizabeth to support herself and their 9-year-old child alone. In 1901, they were living at 30 Villa Street and she was working as a cotton winder. The 13 year old John was already earning as a paper boy and, it seems, they had a lodger4. Somehow they managed but, in 1908, Elizabeth also died5. John was taken in by Elizabeth's married younger sister, Sarah Cook and her husband Arthur, a machine fitter. By 1911 they were living at 52 Nether Street, Beeston with John working as a painter and decorator6. By the middle of 1915, the war had been raging for a year and had absorbed a large number of volunteers to fight - and many had already been killed. It had already become obvious that relying on volunteers was no longer going to provide the continuing numbers that were required to fight the war. Conscription would have been the answer - and was eventually going to be enforced - but it was unpopular so, for the time being, a compromise scheme was introduced in October 1915 by the newly appointed Director-General of Recruiting, Lord Derby. Officially known as the Group Scheme it was widely referred to as the 'Derby Scheme'7. Earlier that year, a National Registration had shown that there were 5 million males, of military age who were not in the forces. 1.6 million of these were in 'starred' - protected - occupations. The Derby Scheme set out to address the other 3.4 million men. Those between 18 and 40 were told that, for a limited period they could enlist voluntarily or could attest with an obligation to come if called up later. They were told that the scheme would end on 15 December 1915. Eligible men were actively canvassed to come forward. John attested under this scheme at Beeston on 11 December 1915, opting for later call-up8. Soon afterwards, on December 27th, at Beeston Parish Church, John married Norah Matilda Mitchell (b. 1890, Beeston), the daughter of George (b. 1858, Ruddington, Notts) and his wife Elizabeth (née Smith, b. c1860, Beeston). Less than three months later, on 6 March 1916, John was mobilised and joined the Sherwood Foresters on the next day. It is unlikely that John & Norah ever had the opportunity to set up home on their own. Norah was to live with her parents for the remainder of their respective lives. Four months later, on 10th July 1916, John left for France where he joined 1/5th Battalion Sherwood Foresters on 22 July. This battalion had been on the Western Front with 139th Brigade and the 46th Division, since February 1915. 46th (North Midland) Division had been the first all-Territorial Division to land in France, had very soon faced intense action at Hooge and had suffered badly during the Battle of Loos in the attack on the Hohenzollern Redoubt. Earlier in July, as part of the Somme offensive, the Division had been part of the diversionary Attack on the Gommecourt Salient, had been blamed - unjustly - for its failure and its commander, Major-General the Hon. E J Montagu Stuart-Wortley was scapegoated and dismissed9. The battalion, in common with the Division as a whole, incurred heavy casualties - 1/5th alone had 494 casualties - was exhausted and, hit by typhoid, trench fever and diphtheria, was in a severely weakened state. Private Cox and many like him who were now arriving were very much needed - though inexperienced in battle. Over the 1916/1917 winter, both sides of the battle on the Somme concentrated much of their efforts to surviving the rain, snow, fog, muddy fields and waterlogged trenches. Elsewhere, preparations for the Arras offensive were underway and, between January and March 1917, the battalion took involved in the Operations on the Ancre, attacks on the Somme front launched as an attempt to keep the Germans attention on the Somme, which succeeded in its objectives. However, just after the battles came to end, on 15 March, Private Cox reported sick with a sprained ankle. This must have been severely disabling as he was then admitted to 16 General Hospital at Le Treport and then returned to England for treatment and convalescence on 15 May. On 29 July he was returned to France and was posted to 2/5th Sherwood Foresters which was, by then, involved in the three-month long series of bitter battles which made up the Third Battle of Ypres - also known as Passchendaele - which had started at the beginning of July. The battalion was a full part in both the Battle of Menin Road and the Battle of Polygon Wood towards the end of September. In the Polygon Wood attack on the 26th September, the battalion was one of several battalions from the Sherwood Foresters that took part in attacks to capture ground that were, in the main, successful but with the almost inevitable high casualties. Private Cox was amongst those who were wounded. Having received a severe gun-shot wound in his abdomen he was taken to No 61 Casualty Clearing Station where he died on the next day.11. 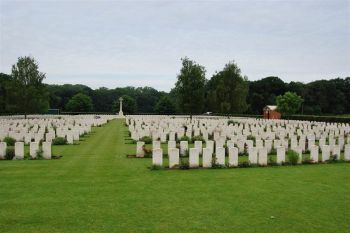 Private Cox was buried in the nearby Dozinghem Military Cemetery, located north-west of Popringe in West Flanders, Belgium. This area was outside the front held by Commonwealth forces in Belgium during the First World War, but in July 1917, in readiness for the forthcoming offensive, groups of casualty clearing stations were placed at three positions called by the troops Mendinghem, Dozinghem and Bandaghem. The 4th, 47th and 61st Casualty Clearing Stations were posted at Dozinghem and the military cemetery was used by them until early in 1918. There are now 3,174 Commonwealth burials of the First World War in the cemetery and 65 German war graves from this period. The cemetery also contains 73 Second World War burials dating from the Allied withdrawal to Dunkirk in May 194010. Private Cox was posthumously awarded the British War Medal and the Victory Medal11. His financial effects, amounting to £3 3 7d were paid to his widow, as sole legatee, on 3 February 1918 and she was also paid his War Gratuity of £6 10s on 28 October 1919. She was also awarded a pension of 13/9d a week with effect from 8 April 191812. By the end of the war, Norah and her parents had moved to 21 Evelyn Street, Beeston and stayed there until the late 1920s when they moved to a new house at 2 Muriel Road, Beeston13. Norah's father, George Mitchell, died in 1934, her mother, Elizabeth, in 1953 and Norah in 1977, aged 8714. 2His birth was registered in Basford Registration District (of which Beeston was part) in Q4/1887 (Ref 7b 186). For some reason, his 1891 census entry recorded his birthplace as Uppingham, Rutland. He was baptised at Beeston Parish Church on 1 January 1888. 3John senior's death was registered in Basford Registration District (of which Beeston was part) in Q4/1896 (Ref 7b 135) - age 53. 4Beeston, 1901 Census, Piece 3153 Folio 16. 5Elizabeth Ann's death was registered in Basford Registration District (of which Beeston was part) in Q4/1908 (Ref 7b 121) - age 56. 6Nottingham, 1911 Census, Piece 20432 RD429 SD3 ED7 Sched 63. 7There is more on the Derby Scheme on The Long, Long Trail website (www.longlongtrail.co.uk/soldiers/a-soldiers-life-1914-1918/enlisting-into-the-army/the-group-scheme-derby-scheme) and the Wiki page en.wikipedia.org/wiki/Derby_Scheme. 8Details of John's enlistment and deployment are from his Army Service Record, available at ancestry.com. 9More can found on this unfortunate episode in Alan MacDonald's book "A Lack of Offensive Spirit?" (www.gommecourt.co.uk/lackbrief.htm) and references in its companion book "Pro Patria Mori" (www.gommecourt.co.uk/men.htm#46th). There is more on Stuart-Wortley at his Wiki page: en.wikipedia.org/wiki/Edward_Montagu-Stuart-Wortley. 11Details from John's Medal Card and Service Record - available on ancestry.com. 14George's death was registered in Basford Registration District (of which Beeston was part) in Q2/1934 (Ref 7b 204). Elizabeth's death was registered in Nottingham Registration District in Q2/1953 (Ref 3c 235. Norah's death was recorded in Basford Registration District (of which Beeston was part) in Q4/1977 (Ref 8 10). The actual date, 13 October 1977 appears in her entry in the 1978 Probate Calendar.